My first instinct was to go towards some type of abstract art, but we’ve done a couple of challenges in past years. So, I took a left turn and decided on something entirely different. 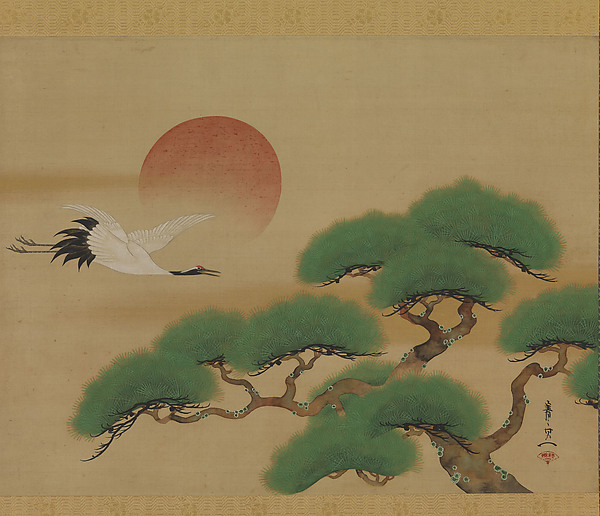 Japanese Art from the Edo/Tokugawa period in the early 1600s to the mid 1800s. 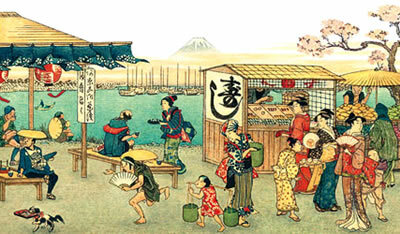 Woodblock printing became very popular during this period and much of the art was created this way. 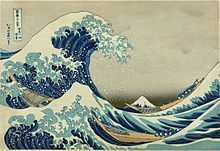 One of my favorites is The Great Wave off Kanagawa. 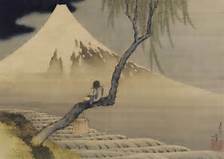 A lot of the art featured Samurai, Kabuki players, Geisha, but then there were more sumi-e ink type paintings that were not as detailed and spoke more of nature. 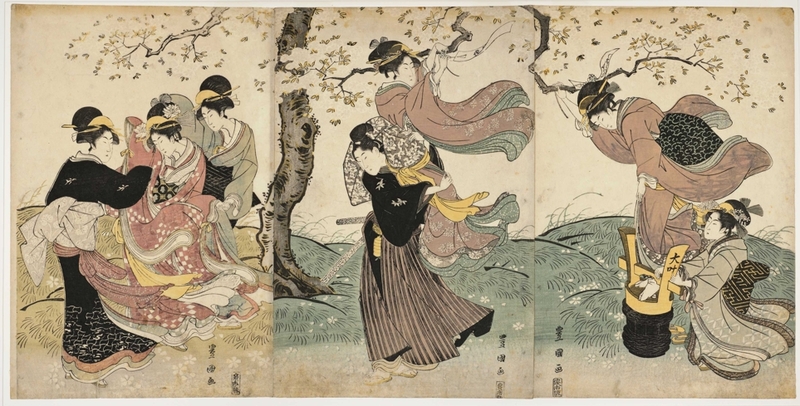 While a lot of the art was very detailed, there were also paintings done in a sumi-e ink style paintings. 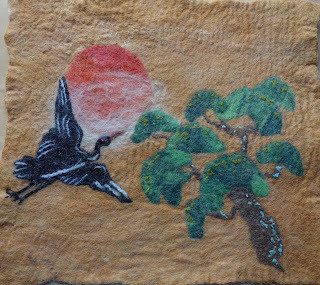 Today, there are a couple of textile artists doing sumi-e ink on felt. But I also like the idea of painting with wool. Here are some simpler paintings. 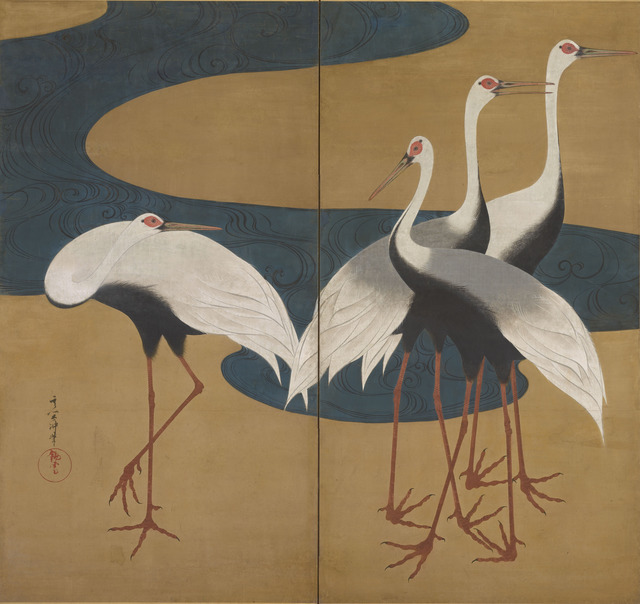 You’ll see a lot of cranes in Japanese art since they have a significant cultural meaning of honor and loyalty. Origami was developed during this period as well. There were also specific crafts during this period. The making of handballs for children, doll making, laquerware and weaving among them. 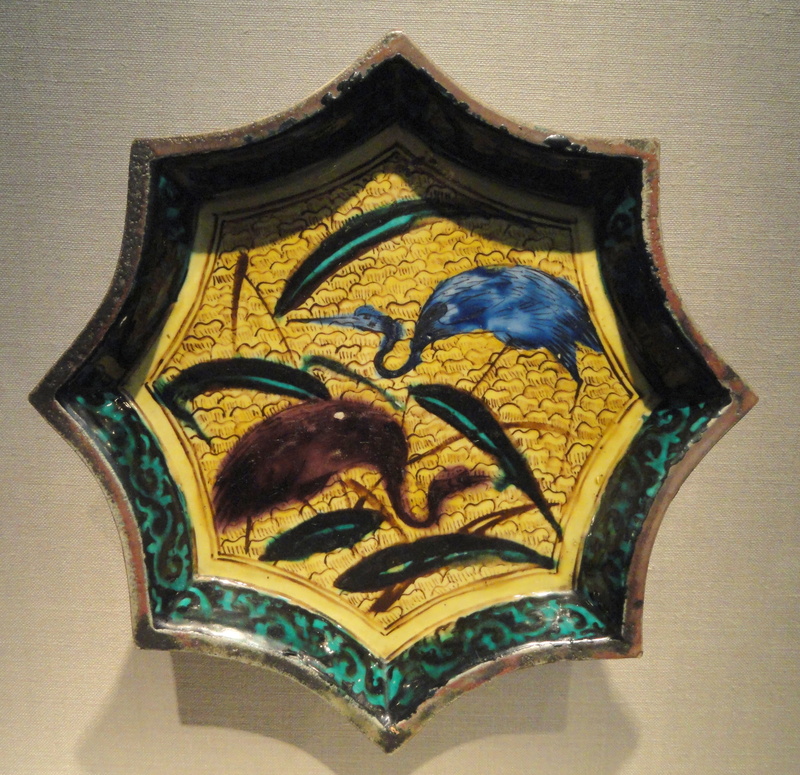 There was also sculpture and folding panel paintings were very popular. And of course Kimonos continue to be an art form today. 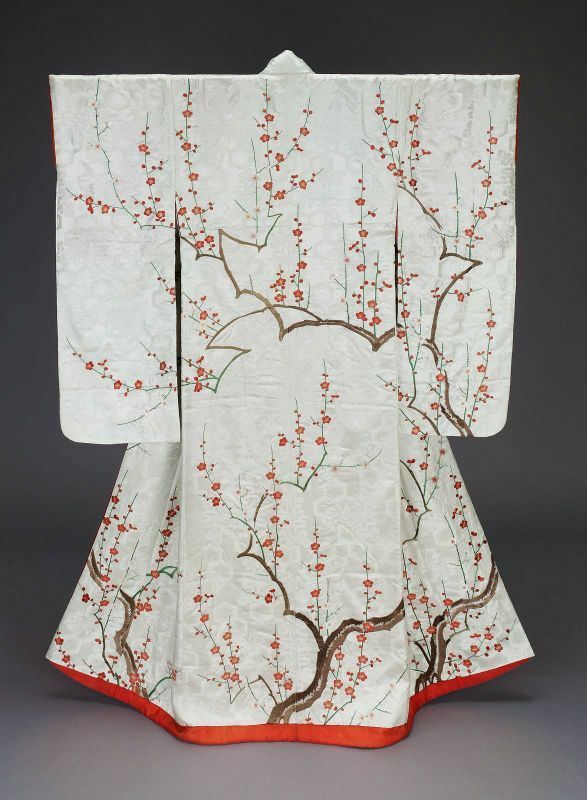 This one is from the Edo period. I think there is plenty to choose from in terms of what you’d like to create. 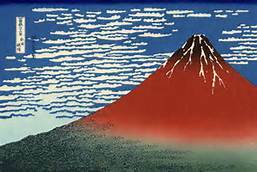 Here is another resource or just Google Edo Art Period for images. I look forward to seeing what everyone creates! Have fun! This entry was posted in Challenges and tagged #rd Quarter Challenge 2017, cranes, Geisha, Japanese crafts, Japanese Edo Art period, Kabuki theatre players, kimono, laquerware, origami, Samauri, sumi-e ink painting, wood block printing. Bookmark the permalink. Definitely inspiration for this challenge. Thanks Penny! Unfortunately, I’m in the states and the series is only in the U.K. But it will help our U.K. Members. Perhaps there other resources here in the states. I hope you are inspired to do the challenge and show us what you make. Thanks Ruth! I hope everyone enjoys it. Thank you Marilyn – a little bit of research coming up! Have fun Lyn! Check out the BBC series sited above in Penny’s comment. I look forward to seeing what you create. The challenge looks, well–challenging! Can you point us to any artists who are currently painting directly on felt, with or without sumi-e ink? Here is her website http://www.joirae.com. I thought there was another artist, but can’t remember the name. If I do, I’ll post it here. Looks like a great Challenge Marilyn. Now should I do some printing or painting with dye or do I paint with wool. I think I need to think a bit. Thanks Ann! It’s up to you, I think an of those options would work. I look forward to seeing what you decide on. Thanks Carole! I’ve never tried the sumi-e, but am fascinated by the simple yet striking strokes. I look forward to seeing what you create using your experience. I’d love to, but as usual I think I’m not organised enough to have time 😩 I promise to try, though! Trying is good. 🙂 I know how elusive time can be. Funny coincidence, Marilyn, we went to the British Museum last month to see the Hokusai prints, but didnt get in, as we hadnt booked ahead, so I brought back two books about him instead. I’d love to go to Japan ! I’m sorry you didn’t get in to the museum, but buying the books was a good move. Japan is a beautiful country with lovely people. I hope you get to go someday. It sounds as if you’re prepared to do the challenge, I hope you join us! Have fun! Thanks Zed! I look forward to seeing what everyone does. Perfect choice Hippopip! You did a great job. Please stop by the Felting and Fiber Forum and post your picture there under the Challenges thread if you haven’t already.